The makers of the popular Monitor Master, a special switch for switching between a color and monochrome monitor, and Mouse Master, a joystick and mouse-port "extender" for the ST, have announced two new products. 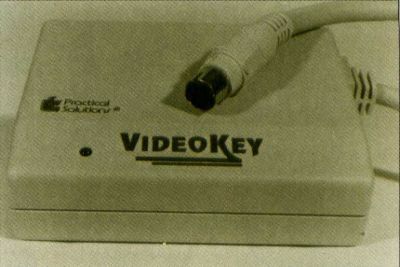 VideoKey allows users of an Atari ST to connect their computer to a composite monitor, a VCR or regular television and provides a separate audio hookup for amplified sound. Practical Solutions claims the brilliant colors attained with this convertor reproduce the RGB screen as closely as possible. VideoKey offers NTSC (RS-170A) standard luma and chroma levels and is compatible with all low-resolution software. It has a case designed to complement the ST and comes with a limited 90-day warranty. Its price is $119.95. Practical Solutions has also announced the latest in the "Master" series of custom-designed switch boxes. 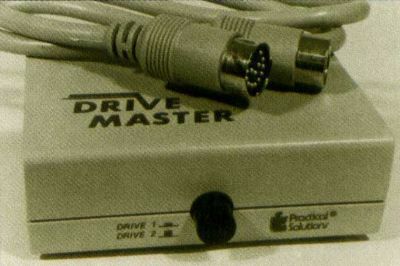 Drive Master switches between two external floppy-disk drives, especially useful for users of pc-ditto, the IBM emulator from Avant-Garde Systems, since a quick press of a button allows you to safely switch between 5.25-inch and 3.5-inch drives. Drive Master comes with a three-foot detachable cable and a custom case designed to complement the ST, and it is priced at a reasonable $49.95.